Learn directly from a chocolate educator who has experience in creating chocolate confections, making chocolate from bean to bar and has been certified in tasting chocolate and cacao and has educated dozens of chocolate enthusiasts on these very chocolate topics. You will gain knowledge of cacao and chocolate and hands on training in mindfully tasting chocolate and walk away with discovering a deeper appreciation for craft chocolate. This course includes a tasting of four different single origin craft chocolate bars varying in percentages of cacao and the opportunity to have fun and connect with other chocolate enthusiasts. At the end of class, everyone will have the opportunity to choose their favorite craft chocolate bar and take that bar home (while chocolate supply lasts!). If you have a hard time picking one, there will be an opportunity to purchase available bars while their supply lasts. 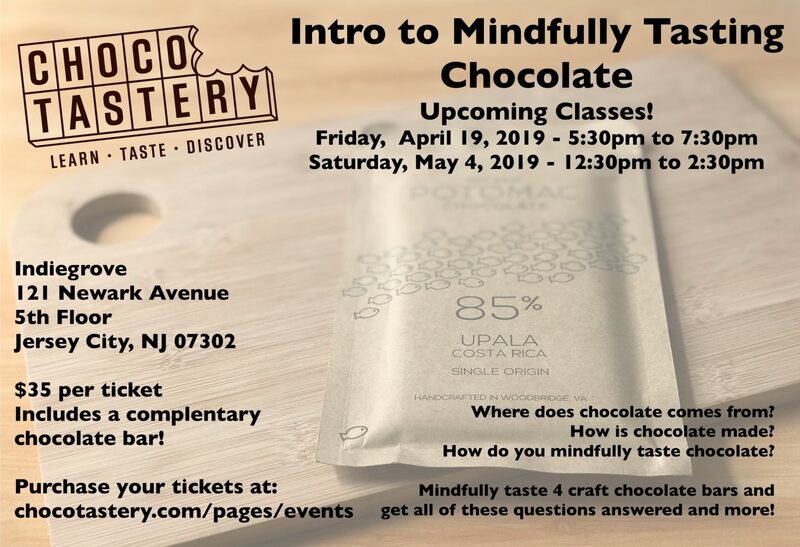 In addition, each attendee will receive a Chocotastery Chocolate Tasting Guide and a Chocolate Tasting Sheet to follow along and take notes during the mindful chocolate tasting. During the tasting there will be water crackers and water served to cleanse your palate. 10% of each registration fee will be donated to Lutheran World Relief to support their Maximizing Opportunities for Coffee & Cacao in the Americas (MOCCA) Program. Lutheran World Relief, along with principal partner TechnoServe, are implementing the Maximizing Opportunities in Coffee and Cacao in the Americas (MOCCA) project, a 5-year, $36.4 million initiative funded by the U.S. Department of Agriculture. MOCCA builds the key agricultural sectors of coffee and cocoa in Guatemala, El Salvador, Honduras, Nicaragua, Ecuador, and Peru, directly improving the livelihoods of over 120,000 farmers. Lutheran World Relief is leading cocoa value-chain activities for MOCCA. Glenn Petriello is the founder of Chocotastery. He is applying his chocolate experience of creating chocolate confections, making chocolate bean to bar, tasting craft chocolate and educating others on these topics to share his passion for chocolate and educate chocolate consumers and enthusiasts to deepen their love and appreciation for craft chocolate through fun, educational chocolate experiences.